If you’ve got a new LG TV, you might have noticed that the picture feels eerily smooth. This effect, which LG calls “TruMotion,” tries to make your TV’s picture feel smoother but often ends up looking strange. 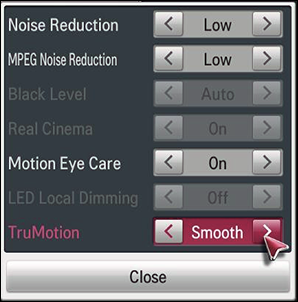 TruMotion is LG’s implementation of motion smoothing. 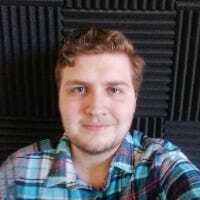 Motion smoothing works by increasing the framerate (the speed at which your TV shows a new picture) of the video by inserting extra “fake” frames between each real frame. Most movies and TV shows are shot at 24 frames-per-second (FPS), and by guessing what the in-between frames would look like, your TV can bump the framerate up to 48 or 60 FPS. This can make certain fast-paced content (like sports) look a lot better, but ruins the cinematic quality of movies and TV shows for some people. While high refresh rate video is weird looking enough on its own, the other issue with motion smoothing is that it’s a fake effect, and often makes the “fake” frames look very blurry. Because it has to guess, it ends up being slightly off a lot of the time, which can make it look even worse. You can disable the TruMotion feature in your TV’s settings. LG’s settings are a bit abnormal though. Their TruMotion tech also manages synced backlight scanning, which syncs the refresh rate with the backlight. They say you can’t turn this off on any TVs, but you can adjust the motion interpolation, which is the thing that makes TruMotion look weird. It’s possible some older TVs might not even have an option to turn it off, in which case you’ll have to buy a new TV if you want to disable it.